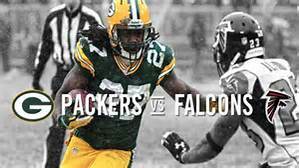 Here are several stats you may not know from the Packers 44-21 loss to the Atlanta Falcons in the NFC Championship Game on January 22, 2017 (the stats all reflect playoff games unless otherwise noted). Green Bay is now 5-4 in NFC Championship Games in the Super Bowl era (since 1966). They are 2-1 at home and 3-3 in road NFC title games. They have now lost three of the last four NFC title games in which they played. Their nine Championship Game appearances is tied for seventh most in the league and their four losses is tied for eighth. The Packers are now 13-11 in playoff games when they do not score first in the contest. Green Bay is 1-2 in playoff games when Mason Crosby misses a field goal. The Pack did not score in the first quarter (the Falcons had a 10-0 lead). They are now 10-8 in playoff games when they do not score in the first quarter… they have lost five of their last eight. Green Bay had a pair of turnovers in the game and are now 3-9 in playoff games when they commit two or more turnovers. Atlanta had a 24-0 lead at halftime. The Packers have now been scoreless in the first half of two playoff games since 1966, both at the hands of the Falcons (the other game was a 27-7 loss to Atlanta in 2002). NFL teams are 17-88 (.162 winning percentage) in playoff games when they do not score in the first half. Atlanta QB Matt Ryan had a Passer Rating of 139.4 in the game. It was the third best Passer Rating in a playoff contest against the Packers (Kurt Warner has the best at 154.1 with Arizona on January 10, 2010). Green Bay is 2-7 in playoff games when the opposing QB has a Passer Rating over 100. Atlanta receiver Julio Jones had nine receptions for 180 yards. It was the most receiving yards versus the Packers in a playoff game by an opposing player. The Pack is 1-4 in playoff games when an opposing player has 150 or more yards receiving. The Falcons had 493 total yards of offense in the game. The Packers have lost six of the last seven playoff games when they allow 400 or more total yards. Aaron Rodgers’ Passer Rating for the game was 91.6. When Rodgers’ PR is 100 or better the team is 6-1 in playoff games; when his PR is under 100, the Packers are 3-6 in playoff contests. Rodgers had an interception in the game… Green Bay is now 2-6 in playoff games when Rodgers throws an interception. Atlanta scored in every quarter in the game. When the opposition scores in every quarter of a playoff game, the Pack is 3-7. Rodgers led the team with 46 yards rushing. That was the second most rushing yards for him in a playoff game; the most was 66 yards rushing against the New York Giants on January 15, 2012. The Falcons converted on 76.9 percent of their third downs. That was the highest percentage against the Packers in a playoff game. Green Bay is 5-6 in playoff games when the opponents convert 50% or more of their third downs. Atlanta tallied 10.3 yards per pass play in the game, the second most in a playoff game versus the Packers. Green Bay is now 0-5 when the opponents average 8.0 of more per pass play in a playoff contest. Green Bay had only 26:21 time of possession in the game and are now 2-5 in playoff games when their T.O.P. is under 27 minutes. The Pack has now lost five straight and 10 of their last 12 playoff games when they score less than 24 points. The Packers are now 1-12 in playoff games when they allow 30 or more points, and are 0-9 all-time when they allow 32 or more points in a playoff contest. The Packers are now 7-7 in divisional round playoff games since 1990 (4-1 at home, 3-6 on the road). The win over Dallas was their first division round playoff win on the road since 2010 when they defeated the Atlanta Falcons on Jan. 15, 2011 (same date five years later) 48-21. In all road playoff games in the Super Bowl era (since 1966), the Pack is 9-12, but they are 5-3 since 2010. The Cowboys scored first in the game. Green Bay has won four of their last six playoff contests when the opposition scores first. They are 7-8 since 2000. Green Bay had the lead after the first quarter, 7-3. Since 1966 the Packers are now 16-4 in playoff games when they are ahead after the first quarter. Ty Montgomery had a pair of rushing TDs in the game becoming the first Packers running back to have two rushing TDs in a playoff game since Ryan Grant had three on January 12, 2008 against Seattle. Montgomery is the sixth Packers running back to have two or more rushing TDs in a playoff game; in addition to Montgomery and Grant, the others are Ahman Green, Edgar Bennett, Travis Williams and Elijah Pitts. Green Bay had the halftime lead, 21-13. In playoff games where the Packers have scored 20 or more points in the first half, the team is 11-1. Their only loss was on January 12, 2013 to the 49ers. Micah Hyde had an interception and sack in the contest. It was his first career playoff sack and first career playoff pick. He became the 47th player in NFL history to have a sack and interception in a playoff game. Other Packers on this list are Sam Shields, Morgan Burnett and LeRoy Butler. Aaron Rodgers threw an interception in the game; the team is now 2-5 in playoff games where he throws one or more pick. The team is 7-1 in playoff games when he does not throw an interception. The Packers led 28-13 going into the fourth quarter. NFL teams are 147-2 in playoff games when they have a 15-point or more lead going into the final period. 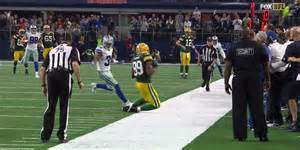 Green Bay did allow 15 points to Dallas in the fourth quarter. Teams are 20-35 when they allow the opposition to score 15 or more in the fourth quarter. It was the third time the Packers have done so, but it was their first playoff win when they allowed 15+ points in the final quarter. Mason Crosby had 10 points in a playoff game for the third time in his career. He is now tied with Antonio Freeman for most playoff games with 10 or more points for the Packers. Rodgers passed for 356 yards and two TDs. It was his fourth career playoff game with 350 passing yards and two or more TD passes. That ties him with Drew Brees for third on the all-time list. Peyton Manning and Kurt Warner top the list with five such games. Green Bay scored in each quarter of the game versus the Cowboys. The team is now 12-3 in playoff games when they tally points in each of the four quarters. Jared Cook had six catches for 104 yards for his first 100-yard receiving game of his career in the playoffs. Two special team stats of note: Crosby had six touchbacks on six kickoffs; punter Jake Schum had three punts for an average of 54.7 yards. In the Super Bowl era, the Packers are now 15-2 in playoff games when they score 30 or more points. Those 17 games are second most in NFL playoff history (Dallas has 21 playoff games with 30 or more points scored). In playoff games where the Pack allowed the opponents to score 30 or more points, they are 1-11… this was their first playoff win when they allowed 30 or more points. The Packers were 0-4 coming into this game in playoff contests decided by three points or less. This was their first win in a playoff game decided by three points or less in the Super Bowl era. Dallas and Green Bay combined for 65 points. The Pack is 5-5 in games where the teams combined for 60 or more points. The 65 points is tied for fourth most in Packers history for a playoff game. The Packers are now 17-5 in home playoff games. They are 6-5 at home in the playoffs since 2000 and have now won three of their last four. Since 2001, the Packers have won the coin toss in a playoff game 11 times and are 7-4 in those games. They have won the last three playoff games in which they have won the coin toss. The Giants scored first in the game. Green Bay is 12-10 in playoff games since 1965 when the opponents score first; they are 9-5 at home and 3-5 on the road in these games. Green Bay was held scoreless in the first quarter. They are 10-7 in playoff contests when they do not score in the first quarter, 6-3 at home, 4-4 on the road. Aaron Rodgers was sacked five times in the game. You would think that would not be a good omen; however, the Pack is 4-1 in playoff games when their QB is sacked five or more times. The Pack had a 14-6 lead at halftime. In playoff games where they have a lead of seven points or more at halftime, the team is 22-3. They have now won seven of their last eight of these games. Randall Cobb had three TD receptions. It was only the second time in Packers history that a player had three TD receptions in a playoff game. Sterling Sharpe had three on Jan. 8, 1994 (did you notice it’s the same date!) in Green Bay’s 28-24 win over Detroit. Aaron Rodgers had four TD passes for the second time in a playoff game in his career (the other game was Green Bay’s 51-45 loss to Arizona on January 10, 2010). The other Green Bay QBs to have four TD passes in a single playoff game were Bart Starr and Lynn Dickey. Rodgers’ Quarterback Rating (QBR) for the contest was 125.2. It was his seventh playoff game with a QBR over 100; Brett Favre leads the team with nine. It was Rodgers’ fifth playoff game with a QBR over 120, most on the Packers team. In fact, Rodgers’ five playoff games with a QBR over 120 are tied with Joe Montana for the most in NFL history. With four TD passes, 350+ yards passing and no interceptions, Rodgers became only the fourth QB in league history to have a 4-350-0 game in the playoffs. The others: Peyton Manning, Alex Smith and Kurt Warner. The Packers were ahead 24-13 going into the fourth quarter. 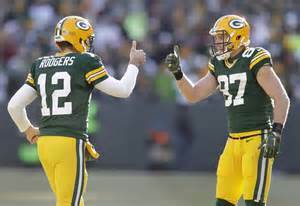 Green Bay is now 15-3 in playoff games where they score 24 or more points before the start of the fourth quarter. Green Bay had an 11-point lead going into the fourth quarter; they are 19-0 in playoff games when they have a lead of 10 or more points going into the fourth quarter. Davante Adams and Randall Cobb both had over 100 yards receiving in the game. 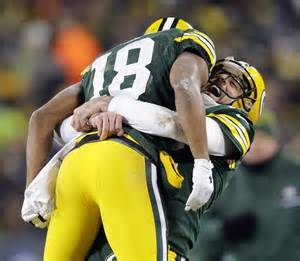 It was the fourth playoff game in Packers history where two receivers gained over 100 yards in a playoff game. Adams and Cobb did in on Jan. 11, 2015, Jermichael Finley and Greg Jennings did it on Jan. 10, 2010 and Robert Brooks and Keith Jackson did it on Jan. 6, 1996. Green Bay had over 400 total yards in the game and is now 5-4 in playoff games when they gain 400 or more total yards in the contest. The Pack had two takeaways and is now 22-9 in playoff games when they get two or more takeaways in a post-season game. They also had zero turnovers in the game and are 12-1 in playoff contests when they do not turn over the ball. Green Bay had 34:31 minutes time of possession in the game and is now 6-0 in playoff games when they have the ball for 34 minutes or more (in a non-overtime game). They are now 15-2 in playoff games when they score 30 or more points. They are 22-2 when they hold the opposition to under 20 points in a playoff game. Here are some of the numbers that helped define the Packers 31-24 win over the Detroit Lions on January 1. The Packers won their season finale and are now a league-leading 21-5 in season finales since 1991. They have won 20 of the last 23 regular season ending games. For the 11th straight year the Packers won three or more games against division opponents (they were 5-1 this season). Coach Mike McCarthy has led the Packers to the playoffs nine times as head coach. He passes Curly Lambeau for most in team history… Lambeau led the Packers to eighth playoffs in his tenure as Packers coach. This was the eighth straight year that Green Bay had a winning streak of four games or more in a season. Green Bay finished 10-6 for the season. The Packers have 12 10-win seasons since 2000, most in the NFC. The Patriots have 15 10-win seasons since 2000 to top the NFL. The Packers scored 40 TDs via passes and 11 via the run. It was the 29th straight year that the team scored more passing TDs than rushing TDs in a season. Green Bay was 9-2 this season when they had one or no turnovers in a game. They were 8-1 in games where they had fewer turnovers than their opponents in a contest. For the season, the Packers were a +8 in turnovers… they had 17 turnovers and 25 takeaways. The Pack was 10-1 this season when they held their opponents under 30 points in a game. Yesterday’s game was scoreless after the first quarter. With the win, the Packers are now 8-4 in such games since 2010. The Packers scored first in the contest and have now won eight of the last nine times when they scored first as the away team. They are 15-8 in games since 2010 on the road when they score first. Green Bay was behind 14-10 at halftime. When the Pack is behind at halftime by three or more points, they had lost seven straight until yesterday’s game. They are 29-64-1 since 2000 when they are behind by three points or more at halftime, and 14-40 in those games played on the road. Aaron Rodgers ran the ball 10 times for 42 yards in the game. In his career, the Packers are 3-6 in games where Rodgers gains 40 or more yards rushing. The 10 rushing attempts in this game were the second most in Rodgers’ career (his career-high is 12 versus Atlanta in 2010). Rodgers ended the season with 40 TD passes. It was the 12th time in NFL history that a QB had 40 or more TD passes in a season… it was the second time in Rodgers’ career. He is now one of only four QBs in NFL history to have 40 or more TD passes in multiple seasons. The others Drew Brees, Peyton Manning and Dan Marino. 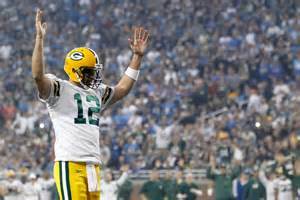 Of the 12 times that a QB had 40 or more TD passes in a season, Rodgers has the two seasons with the fewest number of interceptions (seven in 2016 and six in 2011). Finally, Rodgers becomes the third oldest QB to throw for 40 or more TD passes in a season. Brees was 33 and Peyton Manning was 37. Rodgers had four TD passes, 300 yards passing and no interceptions in the game. It was the 10th time in his career that he was 4-300-0 in a game. That’s tied for the third most games in NFL history with Peyton Manning. Drew Brees leads the league with 18 games and Tom Brady is second with 14 games with four or more TD passes, 300 or more passing yards, and no interceptions. The Packers had 153 yards rushing in the game and held the Lions to 76 yards on the ground. In games where they tally 150 or more rushing yards and hold the opponents under 100, the Packers have now won five straight. Since 1970 they are 69-10-2 in such games and since 2000 they are 29-5 in games where they gain 150+ yards rushing and the opposition is held under 100 in the same game. Green Bay won the time of possession battle with 34:09 to Detroit’s 25:51. They have now won 11 of their last 12 when they have the ball for 34 or more minutes in a non-overtime game. Since 2000, the Packers are 48-10 when they have 34 or more minutes TOP in a non-OT contest. Rodgers led the league in TD passes this season with 40. He becomes the seventh Green Bay Packers QB to lead the league in TD passes in a season. The others: Brett Favre (1995, 1996, 1997, 2003), Lynn Dickey (1983), Tobin Rote (1955, 1956), Cecil Isbell (1941, 1942), Bob Monnett (1938) and Arnie Herber (1932, 1934, 1936). Jordy Nelson led the league with 14 TD via pass receptions. He becomes the sixth Packers player to lead the league in that category. The others: James Jones (2012), Sterling Sharpe (1992, 1994), Billy Howton (1956), Don Hutson (1935, 1936, 1937, 1938, 1940, 1941, 1942, 1943, 1944) and Johnny Blood (1933). Here are some of the numbers that helped define the Packers 38-25 win over the Minnesota Vikings on December 24. With their win in Game #15 this season, the Packers are now 33-13-1 (.713 winning percentage) in Game #11 through Game #16 since 2009. They are one of only two teams to have a winning percentage over .700 in Game #11 through Game #16 since 2009. The other is the New England Patriots who are 36-11 (.761). The Packers have outscored opponents 154-85 in the five victories, averaging 30.8 points scored and allowing an average of 17 points per game. In the five games, the Packers have had only one turnover; they have 14 takeaways in the last five contests. Aaron Rodgers is 115-for-161 (71.4%) in pass attempts in the last five games. He has 11 TD passes and no interceptions. Jordy Nelson has caught 38 passes for 528 yards in the five wins with five TDs. Green Bay has now won nine of their last 10 December games. They are 33-13 in December since 2006 and 21-3 at home since ’06, Mike McCarthy’s first season as head coach. The game temperature was 37 degrees. Since 2010, the Pack is 21-7-1 in games that were played in temperatures under 40 degrees; they are 18-3-1 at home in those games. Jordy Nelson caught a pair of TD passes and now has 14 for the season. He has caught 10 or more TD passes in three seasons since 2011. Rob Gronkowski has four seasons with 10 or more TD passes since 2011 to top the league. Jordy has had 13 or more TD pass receptions in his career in three different seasons and is one of only seven players in NFL history to have three or more seasons with 13+ TD receptions. Green Bay scored 14 points in the first quarter. They have now won 21 straight when they tally 14 or more points in the first quarter and they are 33-4 since 2000 in those games. Jordy had nine receptions for 154 yards in the game with two TDs. It was his third career game with 150 or more receiving yards and two TDs in the same game. Jerry Rice tops the NFL with 17 games with two or more TD receptions and 150+ receiving yards in the same game. Antonio Freeman tops the Packers with five games while Carroll Dale follows with four games. Jordy is next with three games. Minnesota’s Adam Thielen had 12 catches for 202 versus the Pack in the game. He was the second player this season to have two or more TD receptions and over 200 yards receiving in the same game against the Packers. The Pack had a 28-13 lead at halftime. They have now won 16 straight when they score 28 or more points in the first half. Their last loss was to Indianapolis in 1997. The Packers defense had two takeaways. The team is 42-9 since 2010 when they have two or more takeaways in a game. After a scoreless third quarter, the Packers held a 28-13 lead going into the fourth quarter. They are 37-0 in the Mike McCarthy era (since 206) when they have a 15 point or larger lead going into the final period. Aaron Rodgers had four TD passes in a regular season game for the 19th time in his career. The Pack is 16-3 in those games. His QBR was 136.6… Green Bay is 25-1 when Rodgers has a QBR of 130 or higher in a game. It was the 19th game in his career that he had four or more TD passes and no interceptions in a game. That is good enough for sixth place on the all-time list. Peyton Manning leads QBs with 35 games with four or more TD passes and no interceptions. Green Bay did not have a turnover and is now 48-9-1 since 2006 when they do not turn the ball over in a contest. They are 27-3-1 at home in turnover-less games since ’06. The Vikings had 446 total yards in the game. In games since 2000 when the Packers allowed their opponents 400 or more total yards, they are 33-28-1. Nick Perry had a pair of sacks in the game. Since 2013, there have been 15 times when a Packers player had two or more sacks in a game… Perry has five of those games, tops on the team. The Packers have now won 60 straight games at home when they score 35 or more points in a game. Their last loss was in 1971 to the New York Giants, 42-40.